It’s all coming together fairly well and I have to say, I’m pretty pleased with having an adult space that’s (mostly) toy free! There are still a few things that need doing and a few things to shop for but for the most part, everything in the space was what we already owned. There is one corner of the space that isn’t shown in these shots but I plan to do a separate post about that. Make sure you don’t miss it and ‘like’ the facebook page to get updates to your wall. Remember my goal was to create an ‘office’ space so that we could remove the desk from the rec room which would make more play space down there. We installed a new carpet tile area rug (provided by Flor.com who now ships to Canada! Yay!) It was pretty easy to do and the thing I love about the tile is that if one gets stained with juice or scratched up by the cats you can just replace it….or even move it to a spot that’s mostly under furniture so it’s less noticeable. Here’s a better look at the ‘living’ side of the room. We used the couch as a natural divider to split the room up. 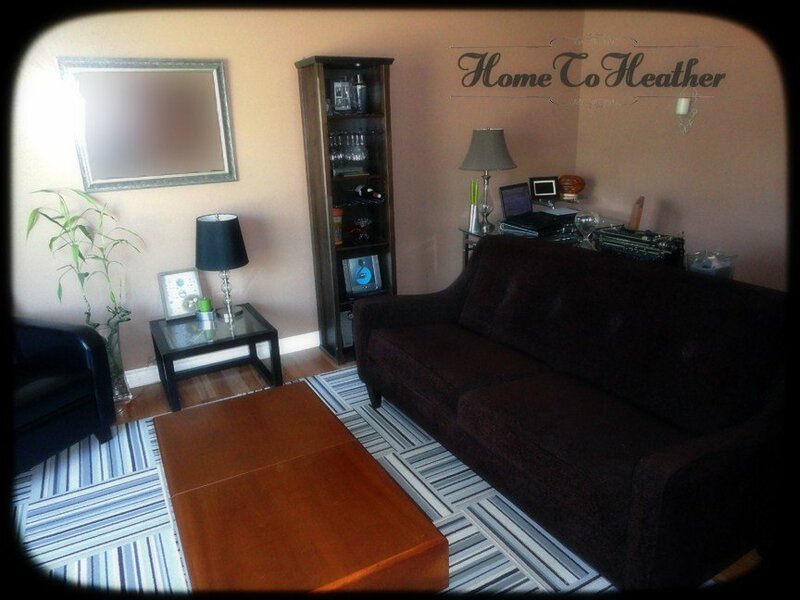 The area rug does that as well and anchors the space separately from the ‘office’ side. Before, our room was all brown. Brown couch, brown walls, brown carpet. The tile has a lot of grey in it and grey is so trendy right now. The pattern is ‘Ups and Downs‘. I think it does a lot to bring a 5 year old room up to date. You might notice my pillows are gone. I got rid of them and am planning on picking up some new ones to coordinate with the carpet tile. I really want to keep the neutral color pallet but adding in some more grey will help break up the brown. Don’t you think? And here is the ‘office’ side of the space. We already had the glass desk and it goes well because it doesn’t make much of a statement. 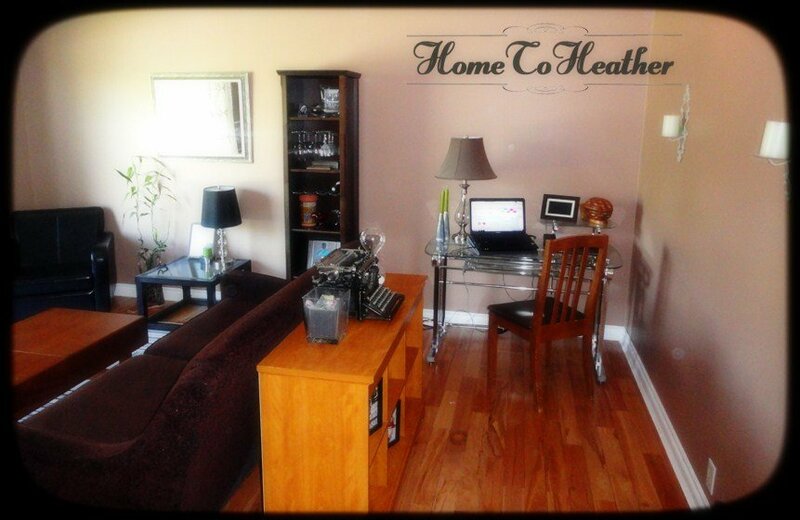 I like that…I wouldn’t have wanted a desk that looked all corporate and stuffy in our living room. I will eventually change out the chair – that one belongs to our dining table. The credenza behind the couch is the perfect place to stash all our office mess. It allows us to keep the desk clutter free. Who wants to stare at software cases and headphones and all that stuff, right? Oh, and see the wall on the right, the one with the candle sconces? Those candles are coming down and I’m going to turn that into a feature wall. Wallpaper or maybe a photo gallery wall will do the trick. I haven’t decided 100% what to do there but I do know I want to bring in some more grey! My CEO approves! 🙂 Like I mentioned earlier there will be at least one more post to showcase that one special corner and I’ll also post about the feature wall when that is done. I can’t wait to see what kind of an impact that will make on the room. Thanks for having a look. Do you have any reno or makeover plans for the summer? Oh it looks great Heather! 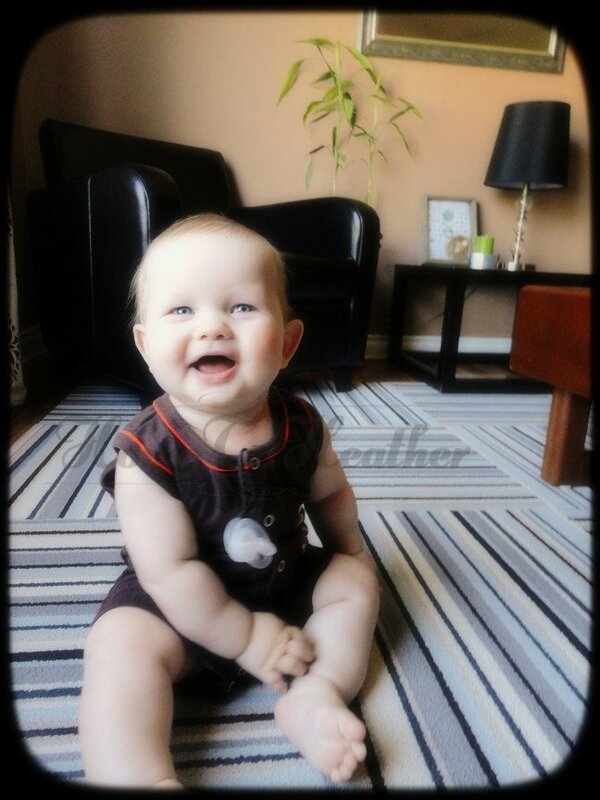 I really like the area rug a lot, especially with a cute baby on it! 🙂 And the way you divided up the room really works. My vote for the wall is to do a photo gallery, I love those. I can’t wait to see what is in your secret corner. I know right! When new things come to Canada it’s like a whole new world has opened up! Your room is looking REALLY nice!! I love the floor tiles! So pretty. I love the after shots!!! Lovely living room!!! Beautiful! Awesome job, Heather!!! LOVE those carpet tiles! Never heard of them before but we will need a new area rug soon so I’ll keep it in mind! p.s. your CEO is super cute!! LOVE it! I liked the room before, but wow what a difference! 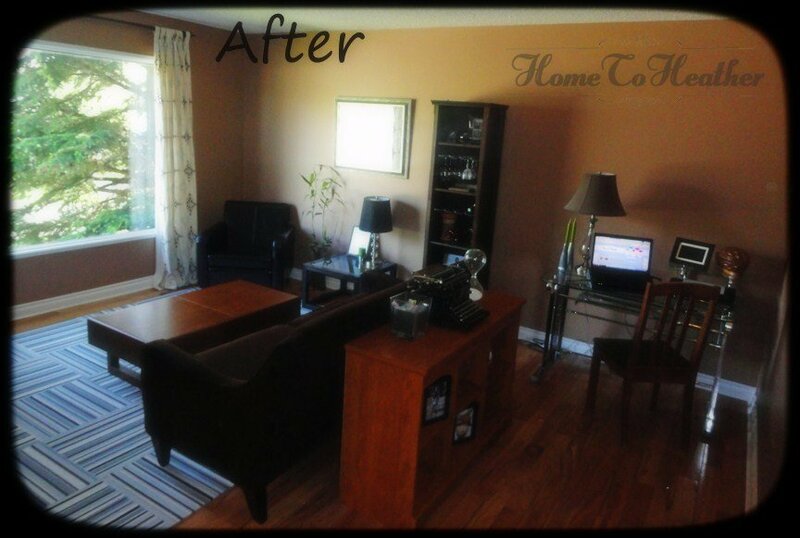 It’s amazing how just some little touches and furniture rearranging make a huge difference. 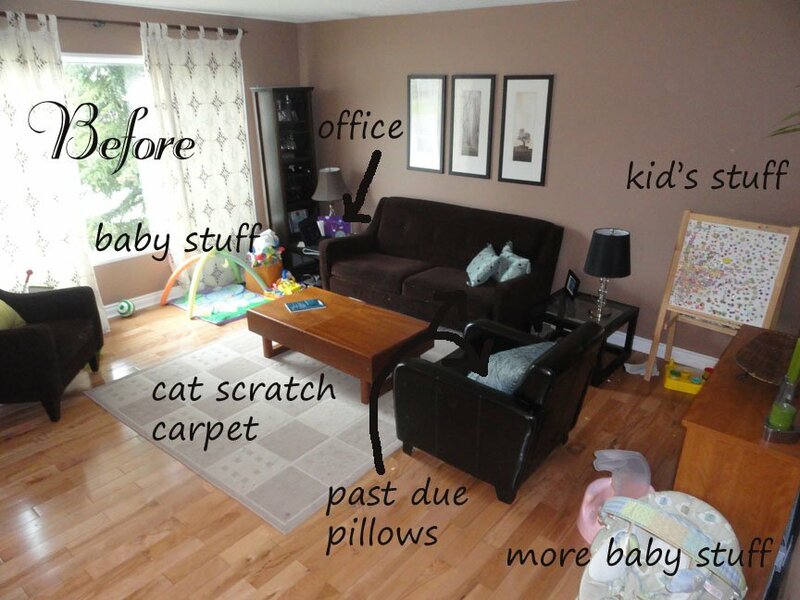 I’ve been itching to rearrange the living room again. I’ve been going through our stuff and weeding out before we move again (Army), so there is room for a playroom once and for all. We’ll see if that happens in this house or the next. That is amazing! You were able to make the room look completely different and it is absolutely beautiful. I love the new carpet! What color is that on the walls? I may have to steal that. Love how it changes color when the sun hits it. It’s gorgeous! I second the photo gallery wall. Oh – and I have the same wall color in my dining room! I love it! I think the gallery wall would be fun! Heather I love it! I totally am going to check out the Flor.com for those carpet tiles – what a nifty idea! LOVE IT!! It looks amazing!! I LOVE the new room! It really does look all grown up now! I am a huge fan of Flor rug tiles! I like the colors you chose and think that grey pillows/cushions will look fantastic! I absolutely LOVE that carpet! The room looks great! I love it! Amazing what happens when you remove kid crap eh? OMG! I love it! It’s so beautiful and stylish. And your CEO is gorgeous. I really like that carpet tile – I’m a big fan of stripes. The baby at the end is pretty cute too!